A �Severe Environment� ( /SE ) option is now available for the First Class A100 Series Anemometers for applications where extra measures are necessary to improve performance/reliability in extreme conditions. The well proven First Class R30 rotor has been subtly refined to produce a variant which retains all of the external features/dimensions of the original R30 rotor and therefore maintains it's First Class performance characteristics. The subtle rotor refinements are designed to enhance operation and reliability in arduous conditions, and together with additional improvements to the anemometer body shell sealing the �/SE� option is an ideal choice for A100 Series Anemometers which will be used in Severe Environments where First Class performance is required together with high accuracy and reliable performance, such as in Offshore Wind Assessment or Wind Turbine Control applications. - Bearings, External Rotor/Cup dimensions, and anemometer body dimensions are identical to the standard product so the First Class performance of the standard R30 rotor is maintained for this variant. ** Enhanced Sealing - Close tolerance features on the rotor hub together with improved anemometer top-seal, and additional bearing protection, significantly reduce the likelihood of water/sand/dust entering the bearings which prolongs bearing life and hence maintains accuracy/calibration for longer. - Provides improved operation in low-temperature & icing conditions, incorporating 12V or 24V �internal� HE-4 heater to ensure bearings/rotor continue to rotate, and black rotor cups for improved natural (solar) cup de-icing. - The proven standard gravity catch design has served well for many years, however the rotor supplied as part of the /SE option includes additional refinements to yield more consistent locking of the rotor assembly to the anemometer body, especially when the rotor is to be fitted when the anemometer body is not vertical such as situations where the rotor needs to be fitted at a time when the anemometer is close to the horizontal (for example: when anemometers are assembled to booms on tall guyed towers resting along the ground before they are raised). - A clamping screw supplements the improved rotor gravity catch to ensure reliable fixing of the rotor in applications where high levels of shock and vibration might occur (e.g. Off-Shore masts, very tall masts, or during raising of guyed masts/towers). - Tests indicate that anemometers with the �/SE� option perform significantly better than our older �/WR� (marine) variants in terms of excluding water/sand/dust, while providing First Class performance (which the older �/WR� variants did not). Standard anemometer electrical/performance specifications & dimensions are unaffected when the /SE option is specified. 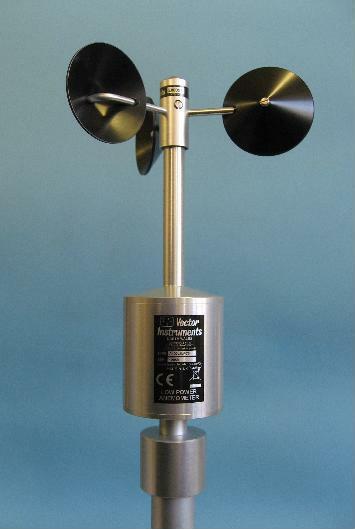 To order, add the �/SE� suffix to the A100 Series Anemometer catalog number. A matching /SE option will become available for W200 Series Windvanes in due course. Design details & specifications are correct at time of writing and may change at any time without notice. Please contact us to confirm the latest specifications. Page Rendered in: 0.292627 seconds. - Powered by Mambo.